So when you are doing wordpress internet marketing (like we do for some of our clients), things change depending on what The Google is doing. Stupid things. Throughout this post I am going to be adding some ideas for you and then making suggestions – PLEASE read the suggestions so you don’t FUBAR your blog and then yell at me! 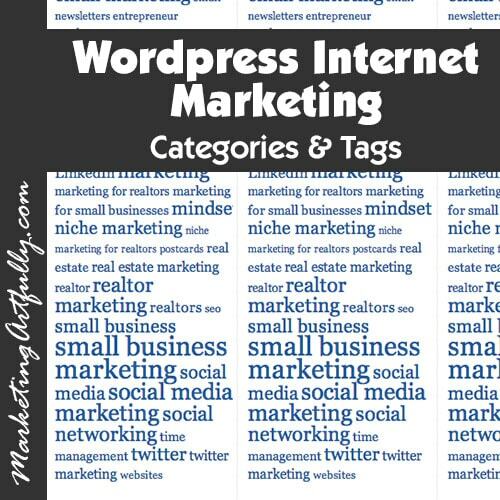 When I started doing marketing on WordPress years ago, the prevailing thought was to have your posts in LOTS of different categories. And oh, the tags, you should have small biz marketing, and small business marketing, and marketing your small business because the Goole had not figured out yet how to follow the rabbit hole down and know that all of those references lead directly back to one blog post (or even a number of them). So today I was talking with a client who has done a FABULOUS job writing content for her corporate wellness blog and we were taking a peek at her blog posts, categories, tags and Google analytics. Wonderfully enough, she had started with us a couple of years ago AFTER the insanity had stopped and we had her content organized into just a few, highly relevant categories. That having been said, they were not the best categories for where her business was two years later and we are going to move some stuff around (not two categories Gluten Free and Dairy Free, but now one Gluten Free | Dairy Free). note – DO NOT change the slug (the url words) since it may already be indexed in google, if you have the ability, seo the title and description but leave the slug alone so that the Google doesn’t think it is a broken link on your website. note – The straight up and down line is a called a “pipe” and is a neutral in programming language. We use it frequently so that we do not cause interent problems with using an ampersand or worse a forward slash which IS a programming keystroke. note – Having 10 strong categories is MUCH better than having hundreds of disparate categories and each post should only be applicable to one category or maybe two or it is too broad! Additionally, they allow for a subset of organization that could be below categories. For example, we have industry based marketing categories on our Marketing and Media Monsters site, but then we have tags that drill down to the type of marketing like video marketing or article marketing. So, just a year or so ago I came upon a site whose admin had put in HUNDREDS of tags using a plugin. Most did not have a post associated with them, but the thinking was that all these disparate words would help with the SEO (search engine optimization). Whenever I have a question about whether something is right to do or not, I check with Matt Cutts, Google’s frontman who tells us things about how we are doing SEO-wise. A search for Tag Clouds and Matt Cutts turns up his take on these from 2010. Now I can’t say that I have ever seen the Google spontaneously change their mind and say that something they considered detrimental was miraculously made a good thing, so I listened to Matt and took my tag clouds off! Why is there so much bad information about SEO data out there? Okay, I am on a tear because one of our clients who hired a bad SEO company emails us almost every day asking if one or the other tactics of theirs is hurting or just not helping. I did a bunch of research with experts in this and watched a funny (funny sad not funny ha ha) webinar where the expert went right down the line enumerating the bad SEO tricks that people were using that hurt their website’s ranking ability. read all about it in my post Keyword Marketing – Does Bad SEO Hurt. That having been said, I get asked often why someone would do that. They got bad SEO info. They are not deliberately trying to hurt my client (I don’t think), just they took a class for sale on the internet with ideas that were 3-5 years old and already rejected by the Google. Doing SEO work is not easy and requires that you keep your own ear to the ground and research, research, research what is working and what doesn’t. Additionally, NEVER do anything that some guru is selling a quick trick to fool Google. Generally I find these all to be old “tricks” that might of worked years ago, but don’t work today. Seriously people, there is NO WAY TO FOOL GOOGLE! They have the smartest guys in the room working day and night to keep ahead of the spammers who are working day and night to figure out new “tricks” to use until they are broken and then sell to the dupes that don’t know any better! If you are a small business owner who is growing an internet empire to last, do not use tricks. Just hire a company that has strong white hat tactics and who will take the time to help your business grow online on strong foundations! Previous Post: « Display Ads – What Are Good Conversion Factors?